The Petermans are an example of ethnic marketing par excellence. Their mission is to encourage recreation, enjoyment, and employment by Americans of all colors within the Great American outdoors; especially Americans of African descent. Their co-authored book is an example of an ethnic marketing campaign rich with facts, factoids, and history created for tourism! Legacy on the Land is authored by Audrey and Frank Peterman, experts on America’s publicly-owned lands system. Their book tells how they came to discover the beauty of the National Park system. The book demolishes the common stereotype that people of color are not interested in the environment. The Petermans founded Earthwise Productions in 1994, a full service consulting and publishing company, and have provided services to the Audubon Society, the National Park Service and, the Environmental Protection Agency among others. After their last child graduated from college the couple began a trip to see America. They also discovered the lack of presence working and enjoying the great outdoors by Hispanic, Asian, African-Americans and Native Americans. 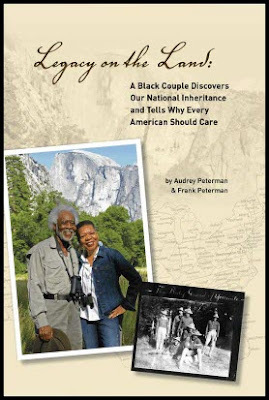 Frank, Audrey, and their company Earthwise Productions, Inc. have been featured in Audubon, Ebony, Essence, National Parks, Odyssey Coleur, and Sailing magazines; the Miami Herald, Atlanta-Journal Constitution, the Fort Lauderdale Sun-Sentinel, CNN Online, USA Today online, and the Washington Times as well as in the book, “Black Faces in America’s Wild Places.” Radio & TV interviews include the Tavis Smiley Show, MSNBC and Fox 5 Atlanta. Honors and awards include: The Spirit of Sweet Auburn “Legends, Heroes & Heroines Award,” May, 2010; the Atlanta Tribune’s “Power Couple,” February, 2009; “The Environmental Hero” 2000 Award from Vice President Al Gore and the National Oceanic and Atmospheric Administration.